Leave your toques and aprons behind and join us on October 8! Unilever Food Solutions invites chefs, restaurateurs, caterers, and cooks to join its first-ever culinary festival to help shape the Philippine dining landscape. The food industry is one of the key areas for growth identified in the Philippines. The steady influx of restaurants – from hole-in-the wall concepts to foreign chains – shows how dining out has become a staple in the Filipino’s lifestyle. With the growing competition in the food industry, Unilever Food Solutions (UFS) – the food service arm of Unilever, maker of Knorr, Lady’s Choice, Best Foods and Lipton – finds it a very opportune time to equip restaurateurs, chefs, caterers, and restaurant operators with product solutions coupled with the skills and knowledge needed to run an efficient commercial kitchen. 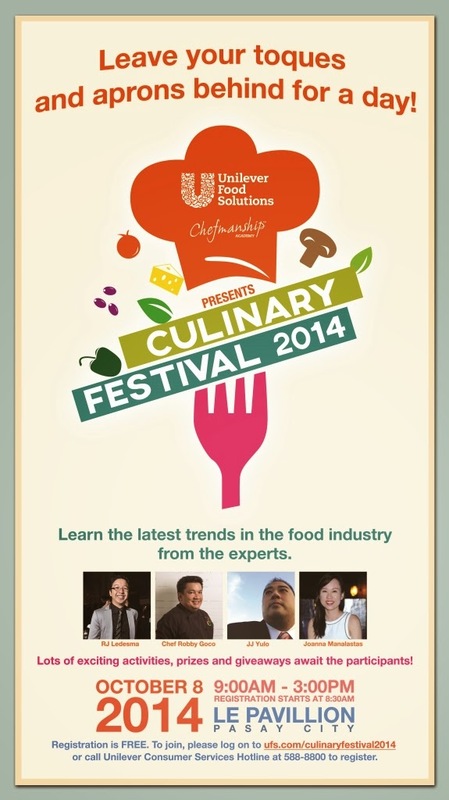 Thus this coming October 8, 2014 at Le Pavillion, Pasay City in Manila, UFS invites chefs, restaurateurs, caterers, and other food service professionals to the Unilever Food Solutions Culinary Festival 2014: a one day only gathering of over a hundred food service professionals aimed to better equip them with their craft. The Culinary Festival is set to feature prominent names in the food industry, such as Chef Robby Goco of Green Pastures and Cyma, Chef George V. Lizares of LJC Group, RJ Ledesma of Mercato Centrale, Food Creative JJ Yulo of Pinoy Eats World, and Joanna Manalastas of Spot.ph, to discuss best practices and explore the various industry trends that today’s restaurant owners and chefs can leverage on to successfully operate their businesses. Divided into three tracks in the morning focusing on the Business of Food, Filipino Food Trends, and Digital and Social Marketing, the expert guest speakers shall join forces in sharing their insights and perspectives on what’s to come in the quickly evolving food industry in the country. In the afternoon, guests will be treated to a session on banqueting or large quantity food production featuring recipes fit for the coming holidays. There will also be exciting booths giveaways and raffle prizes. “With the rising demand for trends and information in the food service industry, UFS recognizes this need to consistently engage restaurateurs and chefs alike with platforms that will empower them with the skills and knowledge for them to run efficient commercial kitchens,” shared Unilever Food Solutions Philippines Channel Marketing Manager Seanta Reyes. This gathering is inspired by the UFS Chefmanship Academy, a roving culinary training program designed to meet the diverse needs of food service professionals. Since it is inception in Germany back in 2009, the program has catered to more than a million food service professionals all over the world. The program offers a wealth of topics, combining real world insights with industry research to offer hands-on learning experiences. “With exciting times ahead for the food service industry, we invite all members of this dynamic field to celebrate the culinary arts” said Reyes. To join the Unilever Food Solutions Culinary Festival 2014, simply register at www.UFS.com/culinaryfestival2014 or call Unilever Consumer Services at (+632) 588 8888 to be part of this exciting milestone in the Philippine foodservice industry. On-site registrations are also accepted.